"we're about to pass close by the island where you were born. Come on up to the bridge, wave to your Papa." The head waiter was Antonello Tievoli. He went topsides, and saw his island, recognized where the Costa Concordia was, and said (I think) "Hey, Skip, right here there's a big rocky reef. Don't you think we might be in a bit too close?" So Captain Schettino threw the helm hard a-starboard, to take his ship back out to deeper water, and so her stern swung to port and hit the reef, tearing a huge gash. Shortly afterwards he knew water was pouring in, and so that the Concordia would sink. He then did the right thing, swinging the ship round in another tight turn, to beach her near the harbor where his 4,200 passengers and crew could disembark with least risk. The ship ran aground and lies today on her starboard side. 99.5% of those aboard were saved, and very many of them owe their lives to his prompt action and good seamanship in making that final turn; had the ship sunk that fast in deep water there would have been a terrible loss of life. 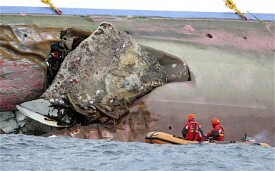 So far, Schettino had made two mistakes. One was to break his employer's rule, by sailing as close as 300 meters from Giglio island, instead of the programmed route about 5 kilometers from shore. For that he needs to deal with the Costa cruise company. The bigger one was to misjudge the proximity of the reef; perhaps he had no idea it was there, for he said afterwards it was not marked on the chart. That should be easy to check, and if it's true the blame for the collision is primarily that of the Italian government, which made the chart. Yet the Captain didn't arrest the government, the government arrested him. Then he made some other bad errors of judgement, but by this time the enormity of what he had done would be crushing his spirit. A simple error, and his career was about to terminate in disgrace; he had caused the loss of a $370 million ship, and had endangered the lives of his passengers - and some did, later, die. I've made a mistake now and again, perhaps you have too (car crash, anyone?) and when the implications hit home it's hard to think straight. In Schettino's case it looks to me as if cognitive dissonance set in; his mind could not process the facts before him so it took him way off course. Instead of taking charge of an orderly evacuation, he wandered down to the lifeboats and "tripped" into one. Located by phone, some arrogant public servant berated him and ordered him back on board; Italians have not forgiven him for leaving his ship. I think I can understand how his neurons were going awry - but they call it "cowardice" and have made some very rude signs using the vulgar language of that government employee. Arguably, Mr Schettino did not have the "right stuff" to be a ship's captain, failing to stay unflappable in a sudden emergency - like, for example, US Air Captain Sullenberger did three years ago. He did very well when it mattered most, deliberately beaching his ship to minimize the loss of life, but then evidently panicked before all were safely off the stricken vessel. That this panic resulted from natural causes rather than cognitive cowardice is a view expressed by a distinguished London physician, Professor Lord Robert Winston. He says it's a common reaction that can make perfectly good sense in evolutionary terms. 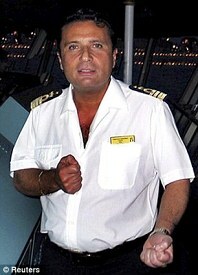 Maybe so, but who certified that Schettino was fit to take such command? - once again, the Italian government. And Costa, which actually gave him Concordia's wheel. There are personality tests and simulated emergencies that can predict how someone will behave in a crisis, and I for one would like to know whether any of them were used, before blame is allocated. The Captain isn't innocent, but doesn't deserve what is being thrown at him. In the coming free society there will be accidents too, and some errors will be foolish. But they will be handled by a justice industry keyed to impartial assessment and restitution, not one rushing to criminalize human frailty; and its judgements will be made rationally in court, not by a media-led lynch mob.